The newest addition to the Qantas Airways fleet has touched down on Australian soil, proudly carrying a retro livery and bearing the name of trailblazing former CEO James Strong. 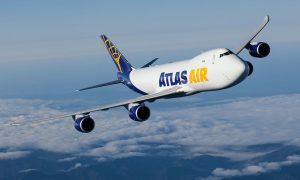 The design is a flashback to the livery that adorned Qantas Boeing 747s in the 1970s and is a flying tribute to mark seven decades of the Flying Kangaroo logo, which falls this month. 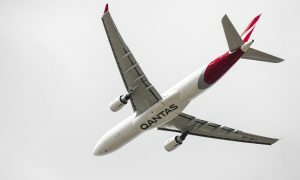 Qantas Airways CEO Alan Joyce joined past and present staff and executives, Boeing executives and other guests to welcome the aircraft after it was given a water cannon salute from Air Services Australia. “Seeing this brand new aircraft in classic livery inspires a real sense of pride in all that Qantas and its people have achieved,” said Mr Joyce. “For 70 years this familiar kangaroo on the tail has represented not just our airline but also the best of Australia and a sense of home for those who have seen it at airports around the world”. James Strong was Qantas CEO from 1993 to 2001 and later served on the Qantas Board until his death in March 2013. His wife Jeanne-Claude and son Nicholas were at the hangar today to christen the aircraft. The new Boeing 737-800, the 75th of the aircraft type, will begin services across the Qantas domestic network from next week. 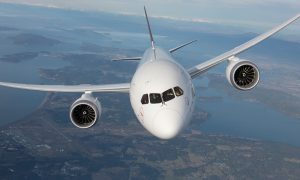 It is the 11th new Boeing aircraft that the Qantas Group has taken delivery of this year. The delivery of the “retro jet” coincides with the week of Qantas’ 94th birthday, which was celebrated on Sunday 16 November. The Queensland and Northern Territory Aerial Services Limited (QANTAS) was registered as a business on 16 November 1920.